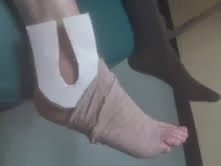 Common compression wrap with felt horseshoe applied to the ankle after a sprain. The hole of the horseshoe should be over the bone with more compression over the ligaments and tendons around the bone. The tube compression is pulled over the top and every attempt is made not to have wrinkles. Rich. My young Cousin in is Berlin w a stained ankle. Do you have any video links to care?